I came all the way to Knoxville for this? I was very excited when a pen-pal of mine told me he'd seen Knoxville on the new Stephen Fry program being shown on British TV. Luckily, I've been able to see some of the episodes and I was curious to see what interesting things he would visit while in town. Stephen Fry decided to take a black London cab (modified for the U.S., of course) on a road trip to all 50 states in a program titled (appropriately enough) Stephen Fry in America. The program is only 6 hours long, so naturally that doesn't leave much time for each state. Still, he does try to show some scenery and explain a bit about what each state is known for. What, exactly, would Knoxville be known for? Its proximity to the Great Smoky Mountains, perhaps? The iconic Sunsphere? The obscenely large Neyland stadium and its orange festooned fans? The Women's Basketball Hall of Fame? Well, those things apparently aren't worth visiting (or even mentioning, beyond some lovely views of the mountains). No, what draws our international visitor is, of course, the Body Farm. Made famous by Patricia Cornwell's novel of the same name, the University of Tennessee's Anthropology Research Facility allows researchers to study how human bodies decay in a variety of situations: exposed to the elements, under plastic, in car trunks, etc. Everyone in Knoxville knows it exists and is heavily guarded against nosy-parkers, but I had no idea that it would be viewed as a tourist destination. Stephen Fry seemed a little surprised that the facility would be so well-guarded, what with all the inhabitants being unlikely to escape. Still, I suppose the macabre sights might attract hordes of unwanted visitors, or at least the occasional teenager climbing over the fence on a dare. While gruesome, the research done at the Body Farm has been groundbreaking in helping scientists and law enforcement understand how bodies decay. After entering the facility, Fry gets a look at the bodies in various stages of decomposition. His helpful guide, a graduate student, is more than happy to uncover bodies and point out various features to the somewhat bemused actor. He does seem to spend a lot of time there, peering into plastic bins and under tarps, so I guess it's only natural that he wouldn't have the time or inclination to see anything else in Knoxville. Pity. On the other hand, at least we did get some international exposure (so to speak), which doesn't happen every day. I just hope the throngs of British tourists who turn up won't expect a guided tour of the facility! As an aside, I have been somewhat astounded that the Americans Fry encounters don't seem to have the faintest idea who he is. Only a professor from Harvard University is appropriately excited and enthralled to be in the presence of the Great Fry. Of course, there could have been a lot of fawning and jumping up and down edited out, but somehow I doubt it . . .
By a strange coincidence, I happen to be reading two books about the Body Farm right now. Both are by Dr. Bill Bass, the acknowledged founder of the facility, and Jon Jefferson. These books are non-fiction accounts of the events that demonstrated the need for the research and study of human decomposition as well as some of the more famous cases that Dr. Bass has been involved with. The two authors have also used their writing skills and intimate knowledge of the topic to write some novels as well. Death's Acre, from 2003, includes some well-known cases, such as Knoxville's "Zoo Man" serial killer and the infamous Tri-State Crematory case from Georgia. Dr. Bass makes the science behind piecing together burned, decayed and dismembered bodies quite fascinating. The most interesting case discussed, from my point of view, involved a body found in a freshly disturbed Civil War-ear grave. Dr. Bass was called in to try to figure out how long it had been since the person found in the grave had been killed. The assumption was that some killer had thought an old grave would be an ideal place to hide a new body. The body in question "appeared" fresh to Bass, and he stated that the person had been dead for two to six months. It turned out, however, that someone had been trying to remove the body of the Civil War soldier, not add a new one. The corpse had been remarkably, and unusually, well-preserved. Dr. Bass points out several times in the book how he was only off 113 years in his estimation of time of death! While this was an early case for him, it is reassuring to read about how even the experts can be spectacularly wrong at times! In 2007's Beyond the Body Farm there are more interesting forensic cases, including one involving J.P. Richardson (aka "the Big Bopper"), killed in a plane crash along with Buddy Holly and Ritchie Valens. Dr. Bass is called in to help disprove some rumors that have been concerning Richardson's family since his death in 1959. I'm waiting to see the rest of the episodes of Stephen Fry's program before giving it my final rating. 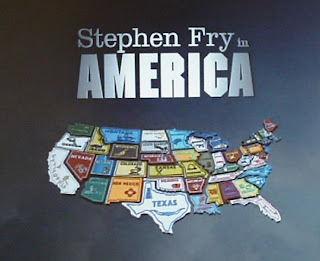 On this side of the pond, it appears that the companion book Stephen Fry in America: Fifty States and the Man Who Set Out to See Them All will be released in the U.S. in May. Something to look forward to! On another note, Stephen Fry takes offense at anti-American sentiments in Britain. He likes us, he really likes us (apologies to Sally Field)! Ooo, I can't wait for May and I'm not shocked at all to read that barely a soul knows who Fry is. And I bet quite a few "House" fans were surprised to hear an English accent coming out of Laurie's mouth Sunday night on the Golden Globes. So no surprise they are oblivious to one of the great comic duos in television history. It's a shame really and I blame our PBS stations who choose to re-run the same episodes of "As Time Goes By" and "All Creatures Great and Small" to nauseum and passing on some great British programming. We watched the series and bought the book. Teh book has a little more info in it but, let's face it, America is a big place and a lot of states get passed by with hardly a comment. Still, it was an interesting series; I recommend it. Thanks for the recommendations Mike! I agree that it would be impossible to do justice to all the states in such a short amount of time. Still, the things he did choose to do in some of the episodes I've seen were odd. For instance, why go horseback riding with the family in Georgia when he dislikes horses (and had recently been in the horse capital of the U.S., Kentucky)? Very strange. Still, I'm looking forward to the rest of it! I can sympathize Melissa! As much as I love Hyacinth "Boo-kay" and the Vicar of Dibly, I do believe anyone who is interested has already had their fill. I know PBS stations are always hard up for money, but you'd think they could at least have a bit of variety. After all, there's plenty to choose from. I saw this series when it originally aired and my wife and I enjoyed it greatly. We did think that he went through most of the country a little too fast and missed a lot of great stuff. We were slightly disturbed by his choice to go to a body farm. Yuck. Jonathan, I agree that the Body Farm was an odd choice, but I guess it did have the advantage of being memorable. I can't really remember what he visited in some of the other states, and I just watched the program a few days ago!